The main cause for not available VoLte or not showing Volte on Samsung Android Nougat Smartphone is Downgrading the firmware or Flashing other country firmware on the phone, but the cause is not limit to this it may also happen due to, flashing Samsung Combination File, Flash with FRP unlock file, Downgrading the Security Patch Level, Country has not been selected on the phone, Flashing with Custom ROMs and Hard Reset or Factory Reset not performed after flashing the phone. What is Voice over Long Term Evolution (VoLTE)? As in this topic we are discussing about VoLTE or Voice Over LTE, then why not have a basic idea about VoLTE used in Mobile communication, let's have as small description about Voice Over Long-Term Evolution (VoLTE). In short VoLTE is a technology used in high speed wireless communication for Mobile Phones and also includes wearable. It is based on the IP Multimedia Subsystem (IMS) network to control and media planes of the voice service on LTE. Normally with this technology the voice service is being transmitted through LTE data bearer and no need to maintain the legacy circuit switched voice network, The VoLTE has up to three times more voice and data capacity than 3G UMTS and up to six times more than 2G GSM, the VoLTE used small packets for voice transmission over LTE so it's do not consume high bandwidth, for more details you can visit the Wikipedia page. Flash the phone with Odin3 using this firmware. Now VoLTE will work on the Samsung J5 Prime, it's tested and 100% working. 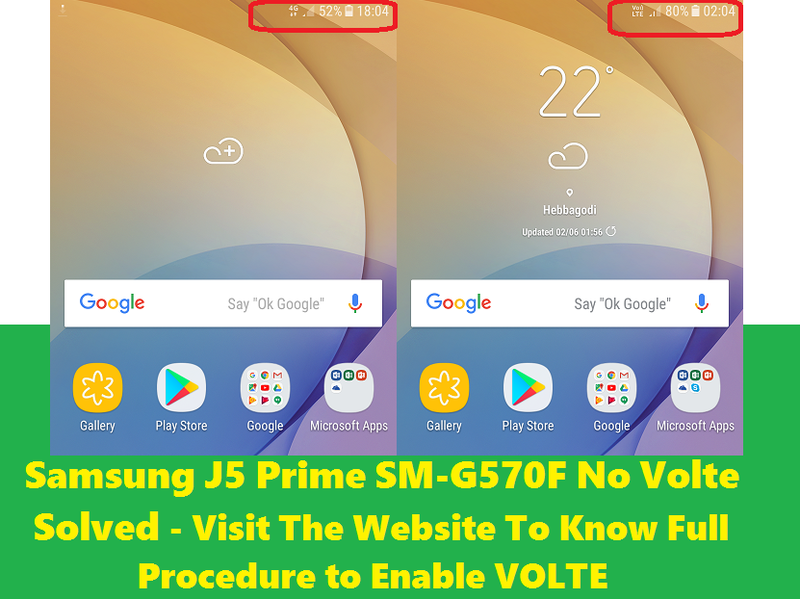 In this way you can solve the VoLTE issue on the Samsung J5 Prime SM-G570F. Samsung firmware download and Samsung flash too download direct and high speed link given in this tutorial and important thing is after flash the phone with this firmware please do factory reset or hard reset the phone otherwise you may not get the VoLTE signal on your device. Note: Flashing Firmware will erase all your data and sometimes flashing may kill the phone, so applying this tutorial must be completely at you own risk and we are not responsible for any damage happens to the phone.